This map shows a number of differences from today. At the right hand side some houses can be seen to the east of Clunes in what is now a field, and there is a reservoir on the hillside above. These houses are not visible on the Ordnance Survey of 1897 - see picture #588. The manse has not yet been built, nor have the Coastguard houses and a market garden and greenhouse stand on what is now Victoria Park. A number of street names now unknown are marked - Brick St, Forsyth St, Ross St, Seaview, Victoria Place, Links Terrace. The Little Vennel is marked as Gordons Lane, whilst Gordons Lane is shown as Manse Lane. The Big Vennel is called Fish Lane, and the Paye is marked as Hugh Miller Place. A very large version of this map which will allow you to read the street names can be seen by clicking the link below the right hand corner of the pic. Note that it is about 200k and may take a minute to download. I also notice that the School was still down on Shore St at that time. I wonder what the large buildings on Braehead (shown as Links Terrace) were at that time? Also prior to the present School, there was another Free Church School on the corner of the present Duke Street & Braehead. If any copy 'Title' for the existing School is held in Cromarty, that should give the name, or ownership of the previous building. Alternatively, a 'Search' could be done through the Education Dept's Legal Dept. Might cost something to investigate, but a chat with the right person, a half bottle, and a brown envelope might do the trick! The original school on Shore Street (now the Anchorage) was sold to my great great grandfather John Hossack by the School Board in 1878 for the princely sum of �30. The house to the right of Albion House, in Church Street, is no longer standing either. This area is now part of Albion House's garden. I see what you mean Clem. If one draws a line from Clunes there must be a great chunk of land that has subsided or something. The map shows a PH on Manse (Gordons) Lane - assuming this is a public house what was it called? I think we had some relatives who lived in the "Shore Inn" I remember my Granny saying that someone died of pneumonia or something after it had been flooded by the sea. didn't jimmy dixon live there at one time.? Mr John Tant, Pheonix Inn at Evanton, will remove from this inn to the Head Inn at Cromarty. I would appreciate if anyone can positively identify which inn this is in Cromarty; and also if there is any more local information on that Tant family. That John Tant had previously been employed as Butler by Alexander Fraser of Balconie and Inchcoulter. His wife was Henryetta; and they may have been related eg cousins. A slightly later Butler to AF in February 1834 was William Tant marrying Katharin Emelia Yellowlees, probably the daughter of another servant and possibly a servant herself. In November 1834, this William Tant joined the Excise Service, his papers showing him as being born in the county of Middlesex around 1808. There is yet another Tant in the area in the same era, John Tant (Vintner) married to Hannah Aldred in London 1820. Three of the first JT's children are recorded with this second JT, living in Mary King Close Edinburgh in the 1841 Census. This second JT and HA had a son Charles. Apart from this newly-found 1829 mention above in the Inverness Journal, I have no other traces of "my" John Tant and Henryetta. My suspicions are that they died around 1836 when there were some form of eoidemic in the area generally. I have complete extracts from the OPRs, SRs, Wills and Censuses on Scotland's People; and from Find My Past. Alexander Fraser, his son Evan Baillie Fraser and Dr James Wishart are commemorated in the names given to the descendents of those three Tants, to the extent that there was still an Evan Baillie Fraser Tant in Edinburgh about four years back. Additionally, the names Henryetta (inc Henry) and Hannah Aldred appear across the three lines, suggesting some close connection of kith and/or kin; but no solid proof. Most of the present Edinburgh area Tants are descended from William Tant and Amelia Yellowlees, also including an Australian line. John Tant and Hannah Aldred's descendents are mainly in Lancashire. Most of "my" John Tant and Henryetta's descendents ar scattered far and wide, mainly England with some in Germany and Canada. It is more local records, mentions, grave stones etc that I am seeking. Further to my posting of 7th January 2009, I have received a scan of John Tant's move to the Head Inn Cromarty. JOHN TANT respectfully intimates to the Inhabitants of Cromarty, its vicinity, and the Public generally, that he is to REMOVE, at the Term of Whitsunday first, from the Phoenix Inn at Evanton, to the above Inn, which is well known as being for several years back occupied by the late Miss Cormack. J.T. further intimates, that Travellers and others may rely upon every attention and comfort. John Cormack has taken the house in New Street, possessed by the late Murdo Ross, and turned it into an Inn. 1824 Cromarty Inn. John Cormack has retired from the inn & his sister, Mrs Elizabeth Cormack, will continue running the inn. 1829 Cromarty Inn, death of Mrs Cormack & sale of furniture. I have noted the references to Mrs Cormack & Miss Cormack, suspecting confusion in that era. 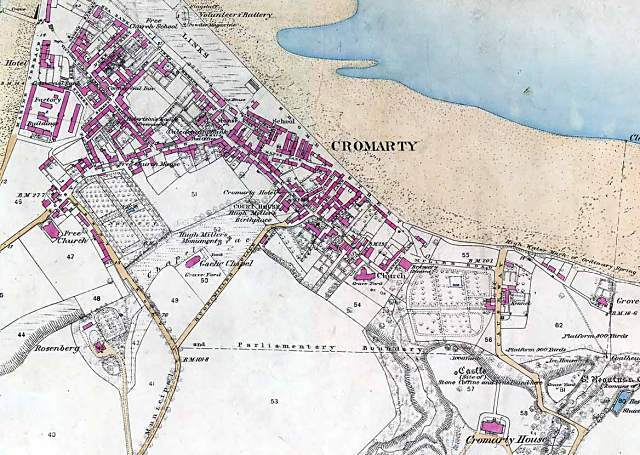 However, can anyone clarify particularly the location of the Head Inn - could it be the present Royal Cromarty Hotel? There is mention on our deeds of two sisters, both called Miss Jack who used Wellington House as surety on a loan they had from "Isabella Barbara Couper, Innkeeper, The Shore Inn, Cromarty" in 1908. It was witnessed by William Valentine Neill who was renting all or part of Wellington House at that time. Hannah and Mary Jack from Highgate and Ealing, London had inherited the property from their aunt, Mrs Christina Creech who named Wellington House in the 1880s, after her previous home, Wellington Lodge, West Bay, Dunoon. Until then, we presume it was known by it's number in Church Street. The house shown to the right of Albion House on this map was I believe burned down prior to 1869. In 1869 the ruin and land were sold by a Patrick Robertson of London to David and Elizabeth Murray. They are shown in the 1881 census as the owners of Wellington House. A servant; Marion Ross, who I believe was deaf was shown as residing with this eighty year old couple. The Murrays left their property to their eldest daughter, Elspet MacAndrew of Geelong, Australia. I believe she never lived here but sold it to Mrs Creech of Dunoon in 1888. Incidentally it is interesting to note, if you enlarge this map, that the Lady's Walk appears to end when it comes to the top of Wellington House garden. In my search for my ancestors, John Tant and Henrietta, the following records have come to light on the NAS site - following up. John Tant (Innkeeper, Cromarty Head Inn) and Henryetta. I obtained a copy of the Summons for the 1835 Debt, on the assumption that being "local" and last, that it may have details of use to me. Obviously this is not absolute proof that John Tant was alive that day; but it seems most unlikely that he wasn't. This narrows down the times of the deaths of the couple to being 1835 to 1841, if absence from the 1841 UK Census; and the presence of three of their children with the other John Tant and Hannah Aldred in Edinburgh, 1841 Census. The Debt seems to have been paid before any Court appearance, as there is a final page to record the verdict of the Court; and the relevant parts are blank. My great great grandfather is recorded in the 1871 Census as living in Braehead House, George's Square, with his wife and 8 children: he was a surgeon. I see no George's Square, but I presume this may have been somewhere near George's Street down by the point? Interested in 1841 map. I'm trying to trace Reid family who according to 1841 Census was living in what looks like Rofs's Lane. Whilst there in Aug 2010 couldn't find anyone who knew of this but eventually came across Rose Lane. However, looking at the 1871 town map notice there is a Ross Street. Could this originally have been known as Ross Lane? Any assistance welcomed! It is most likely Ross's Lane as the double s used to be written like an f.
Yes, I agree but there is no Ross's Lane on the 1871 map but a Ross Street. Wondered if this had changed its name over the 30 year gap? I don't know how rigid they were about the street - lane difference? My g-g-grandfather and his family were recorded in Rose Street in the 1841 Census (written very clearly and unambiguously, too). So the Census collectors are distinguishing "Rose" and "Rofs": but perhaps not "Street" and "Lane"? Or perhaps they have the "Street" and "Lane" bits as in the 1871 map and confused the other? Keep in mind that as Last Names, Ross and Rose are accepted as variants. Still not located positively The Head Inn in Cromarty. Innkeeper 1829 to 1835 or later, John Taint/Tant and his wife Henrietta, previously at the Phoenix Inn Evanton and earlier Butler to Alexander Fraser of Inchcoulter and Balconie. John Tant, Vintner, and his wife Hannah Aldred (married London 1820) had son born in Cromarty 1831 and were next found in Edinburgh, 1841 Census, with three of the children of the first John Tant and Henrietta. There was also William Tant, born about 1808 in "Pancras, County of Middlesex" who in February 1834 had become Butler to above Alexander Fraser; and in November 1834, joined the Excise Service with Alexander Fraser (above) and Doctor James Wishart as Guarantors. About 2000, there was an Ian Charles Tant interred in Cromarty - he is not a known relative, his father being SAmuel Tant of the Royal Marine Artillery stationed in the area in 1917. Thanks for this information - must agree that the census takers did seem to have some latitude with details taken. Therefore I'll take the Ross's Street as being Ross's lane - it may have had some significance anyway as it seems close to the harbour and as the family were in the main women fishsellers. Except for William Ross who became an apprentice tailor. How I find out who he was apprenticed to is another chapter! If you come across anyone who knew a seaman by the name of George Ross who hailed out of Burghead I'd be very interested. Many of the names are different. e.g.Allan Street is now Allan Square and Barkly Lane is now Barkley Street, so Rose Ross and Rof are likely one and the same. Actually on the map itself there is a Ross Street and a Rose Lane so I have two addresses that could be attributed to the Reid family. But thanks for your info. The Enumerators were given instructions that if recording themselves or other Enumerators, this must NOT be given as their occupation (two weeks out of 10 years). I have found about a dozen in the 1881 Census giving their occupation as "Enumerator" or "Census Enumerator". In the 1881 Census covering Fife, there is one "Head of Household" listed with the addition "Since Dead". In Aberdeenshire, for a farm, there are two persons listed with almost all the details "Unknown" er sim, apart from one being identified as "Male" and the other "Female". An unusual duplication is that George Stephens born in Fife 1829 - later Lord Mountstephens, with his wife and the latter's personal servant, are all shown bin both the 1881 British Census and in the 1881 Canadian Census. When I was a child in Cromarty in the 50's there was a tailor on Bank St called Mr Grant. Don't know how far back his shop went. Will be in Cromarty next week so will ask some of the old timers. Grateful of any information on tailors in Cromarty to link William Ross as apprentice to. Enjoy your trip to beautiful Cromarty where the folk are so friendly and helpful. I would like to find an area called Reid's Place or Reid's Square in Fishertown. My g-g-grandfather was called David Munro – he died in Tain in 1863 and his occupation is shown as Grocer (journeyman). He was married in Cromarty on 12 June 1835 to a Janet Grant. In the 1841 census, he and his wife, with 3 children, are shown as living at ‘Reid’s Square’ in Cromarty. By 1851, he had moved to Rosskeen / Invergordon. His later records claim that he was born in 1809 in Cromarty, but I can find no trace of the birth. His wife (Janet Grant) is, however, in the birth records for Cromarty born 5 February 1810. His death record shows that his father was also David Munro an innkeeper, presumably also in Cromarty. Any additional information about the inn that he owned / managed would be welcome. I discovered evidence of a W. Ross who was a tailor in Cromarty in the 19th century from the records in the old Courthouse. Unfortunately, because of a family emergency at the end of my visit I lost the notes I made while at the Courthouse. The census should have record of him. I am not sure if there is a connection but I believe my g-g-g-grandfather John Holme married a Jane (Jean) Munro. Their son Enoch Holme b-1824 in Fearn Rosshire was married to Mary Cameron b-RoseFarm, d-1913. There son John was born in 1855 in Rosshire and came to Canada where we are now located. I found my notes re the Courthouse and my apologies, there was an ANDREW Ross cited for something in 1897. Further to my earlier requests regarding the identification of "The Head Inn" Cromarty, taken over by my ancestor, John Tant, I have now found a reference to probably the same establishment as "Tant's Hotel" in the Edinburgh Gazette. I have yet to get a positive identification of the pemises. I have an original cloth backed paper copy of the 1871 map, which I was given permission to use in any way I wished by Ordnance Survey (I had a licence in my office at the time). I copied the map and coloured a couple of the copies, one of which I gave to Clem which looks very like the one which you show here (a mark was put on the original which I transferred to the copies). The original was found by me along with two very old wooden candlesticks in a blocked up cupboard in the house formerly owned by "Sackie" Campbell in Church Street, which had been bought by David Mackenzie the Ironmonger. I was doing work for David at the time and he gave me the map as a gift (but not the candlesticks!). I still have this original, although it's not in great shape. Incidentally, you can see where my father Daldon lived and had the Chemist's Shop was then two separate buildings. The buildings were occupied in 1851 (about 30 years before the current house was built) by James Johnson, Blacksmith, his wife Christian, their two daughters Betty and Christian, and Jane, a grandaughter (Betty appears to have been born in Portugal). I have since been informed that The Head Inn, aka Tant's Hotel, was located where the present Primary School now stands. My father is Evan Baillie Fraser Tant who still lives in Edinburgh. Please e-mail me, as we are either related or have TANT family contacts via the multi-generation name of EBFT, as you will have seen above. Terence Yellowlees Tant (b.1899), my grandfather had a brother Evan Baillie-Fraser Tant, they fell out with one another, but Terence named one of his 6 sons Evan Baillie Fraser Tant, who was your grandfather Cassie? My mother was Elizabeth TANT, descended from the first John Taint/Tant up in the Cromarty area, as Butler to Alexander Fraser of Inchcoulter and Balconie, Evanton. This first John Tant first appears in the Scottish Records in 1822, at the Baptism of his first son, Henry, with the mother being Henryetta ...? A second John Tant appears as a Vintner, across the Firth in Cromarty, 1830, at the Baptism of his son, Charles, this second John Tant's wife being Hannah Aldred. John and Hannah are recorded in the London "Bishop's Transcripts" as being married down there in 1820. Your Alexander James Wishart Tant is the son of William Tant and Amelia Yellowlees. William Tant and Amelia Yellowlees first appear in the Scottish Records, when they married in February 1834, William also being described as Butler to Alexander Fraser, presumed in succession to the first John Taint/Tant. In November 1834, William applied to become an Exciseman, Alexander Fraser and Doctor James Wishart of Dingwall being his Guarantors. I have a copy of his Excise Entry Papers. William and Amelia actually had two sons, named AJWT, the first being born in Forgue Aberdeenshire 1837 and dying by 1844 or early 1845, as he does appear in the 1841 Census. A second AJWT is born to the couple in 1845, down in Whitby - William's posting as an Exciseman. This second AJWT migrated to Auatralia about June 1881 from memory, as he does appear in the UK Census held about 3 months earlier. All three lines in earlier generations acknowledge that they are related; and there is strong evidence for this, such as the sharing of unusual names, particularly Evan Baillie Fraser Tant after AF's son, Evan Baillie Fraser - BUT no HARD EVIDENCE. I have extracted virtually all of the avilable records covering those three lines of Tant from that first Scottish appearance down to 11900, with slightly lesser coverage since then; and still adding as more records become available on-line. Regarding proven relatives of AJWT, his direct descendents are mainly in Australia; and those of his siblings are scattered around Central Scotland and in England. I can help you as I have extensive records of the TANT families in Scotland. See the cryptic version of my email address in my posting 29 May 2015. There should be a "." after the "u". Also, Cassie, would appreciate you also contacting me. Given your Grandfather, Terence Yellowlees Tant, was born in 1899 Malta Terrace Edinburgh, died 1986 Morningside, with a Brother, Evan Baillie Fraser Tant, born 1897 Comely Park Place Edinburgh, died 1914, their father was another EBFT, born 1866, died 1919. In turn the father of that EBFT 1866-1919, was WILLIAM Tant, b 1828 d 1901. We are directly related by that WILLIAM Tant and his wife, ANN Plummer. WILLIAM was the son of the earliest Scottish Tant, JOHN Tant/Taint and his wife, HENRYETTA ... (Surname not known). However, at present, I have not located any direct links from our first Scottish Tant line, to that third line descended from William Tant and Amelia Yellowlees. Almost ironically, although there is no direct/recorded Tant link from our first line, to the second line from John Tant and Hannah Aldred, the sister Mary of Ann Plummer above, married a second line John Tant, the son of John Tant and Hannah Aldred. I am searching for information. I believe my g-g-g-grandfather John Holme married a Jane (Jean) Munro. Their son Enoch Holme b-1824 in Fearn Rosshire was married to Mary Cameron b-RoseFarm, d-1913. There son John was born in 1855 in Rosshire and came to Canada where we are now located. I would be very appreciative of any information related to the above. Contact me by e-mail, as described in my earlier posting. I think I have found a lead etc. I wonder why Appeals for information are placed on this site, yet although I freely offer information, certainly sufficient to show that I have extensively researched the particular TANT families, that the posters don't follow up and contact me. In furtherance of my TANT Families research, does anyone know if the the estate papers etc of the Inchcoulter and Balconie estate, particularly when owned by Alexander Fraser, have been preserved and are accessible? I am particularly interested in the period from 1820 to 1837, when those families first appeared in Ross and Crmarty. John (1) from 1822 to 1827, was Butler to Alexander Fraser. 1829 to 1835 - Ran the Head Inn, Cromarty aka "Tant's Hotel". 1835 Last known record of John (1) and Henryetta, when served with a Writ for Debt. John (2) Tant and his wife, Hannah Aldred. This second John was a Vintner, in his son's Baptismal Record. In the 1841 Census, this couple are living in Edinburgh, with both their own children; and also three of the children of John (1) and Henryetta. No further direct records found for John (2). Hannah died in Edinburgh in 1848, John (2) is mentioned; but no indication whether alive or dead. William Tant also Butler to Alexander Fraser marrying Katherin Amelia Yellowlees, Kiltearn Parish, February 1834 - Amelia is local. William Tant applying to join the Excise Service, sponsors Alexander Fraser (above) and Doctor James Wishart of Dingwall. Plenty of subsequent records for William and Amelia, until their respective deaths, William in 1898, Amelia in 1893. Whilst the likelihood is that all three Tants are related, no absolute record proof so far. If anyone comes up with more TANT/Taint information, my e-mail address has changed. I have been researching William Tant in Scotland for many years because I suspected that he might be an ancestor of my mother (1900-1978) who was born in East Anglia. The reason is that she claimed that family history was that two brothers came to England from France, one became a farmer and the other went to Scotland. My mothers ancestorGeorge (b1795) became a farmer but I have no information concerning his origins. William came from Farming stock and his records say that he was born in St Pancras but the records for 1808 were destroyed in WW2. There are many Tants in East Anglia around the time of Williams birth. Interesting how various persons have asked about the various TANT families; but NONE have responded to my OFFER of sharing the extensive information that I have, FREELY etc. Due to the scaling of the offered maps and their dating, it is not "perfect"; but it may be of some help. As indicated previously, I have a lot of information about the three TANT lines that appeared in Ross & Cromarty 1822 to 1834; and I am willing to share this freely. This so interesting reading all this information and comments. Alex I tried to email you but it would not let me. Although I have an original copy of this map, I copied it and coloured it to make it easier to identify buildings from gardens and roads etc. I gave a copy of this coloured version to Clem Watson, which is the one shown here!